The TIDA-00367 is a 150 W flyback converter based reference design created for powering low voltage BLDC motor based applications using a companionTI Design TIDA-00447, 24V Dual Brushless DC Motor Drive Reference Design for Major Home Appliances. 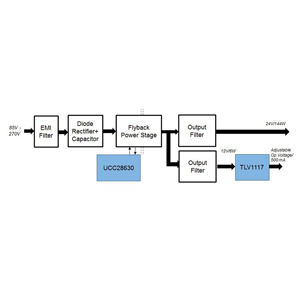 This reference design is a primary side regulated flyback converter based on the UCC28630 controller. 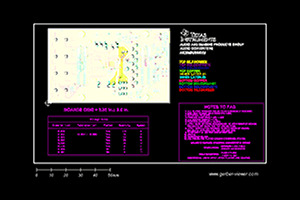 It works in either discontinuous conduction mode (DCM) or continuous conduction mode (CCM) depending on the input voltage conditions and delivers a tightly regulated 24V output and a loosely regulated 12V output.Primary Side regulation helps in eliminating the use of secondary side feedback components without impacting the performance thereby reducing BOM count and increasing the reliability of the design. The hardware is designed and tested to pass the EN55011 Class B conducted emission and Surge Norm EN – 63000-4-5 . 150W Flyback designed for operating in the wide input range from 85Vac-270Vac. High efficiency of 86% at full load. Low Standby power consumption of 200mW at 230-VAC. Built-in active X-Capacitor Discharge Function to meet SELV limits and eliminates the use of external bleeder resistor. Primary Side Regulation in both DCM and CCM mode of operation. Robust Power stage with built in protection for Overcurrent, Overvoltage, Over-temperature, AC Line UV, Brownout. Meets the requirements of Conducted Emissions standard – EN55011 class B.